As a graphic designer, creative director and leader at Ammunition, Brett Wickens partners closely with clients to create unique points of view through brand identities and user interfaces. He began his career as a partner in the London studio of the acclaimed British designer Peter Saville. While there, he developed renowned packaging design and campaigns for clients including fashion designer Yohji Yamamoto, seminal artists Joy Division and Peter Gabriel and the French Ministry of Culture. Wickens then went on to become an associate partner in Pentagram’s London office before joining LA-based Frankfurt Balkind Partners, where he directed new media initiatives and campaigns for major Hollywood studios. Wickens is the designer behind the famous logotype for HBO’s The Sopranos. 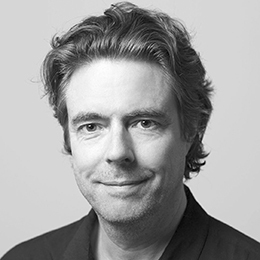 Wickens later joined Sapient as global creative director and went on to become a principal at MetaDesign, where he directed interaction and branding projects for clients including MTV, San Francisco Ballet, Adobe and Shangri-La Hotels. Wickens has appeared as a guest on NPR as well as served as a featured speaker at numerous design industry events. He was a contributing editor of EYE magazine and taught at the California Institute of the Arts. A four-time nominee to the Cooper Hewitt, Smithsonian Design Museum National Design Awards, Wickens’ work can be found in the permanent design collection of the Victoria & Albert Museum in London.